A man suspected in the killing of a Southwest Washington sheriff’s deputy is dead after an encounter with law enforcement officers Sunday evening. The Cowlitz County sheriff told KGW that police fatally shot the man thought to have killed Deputy Justin DeRosier the night before. Two other men are in custody, according to the news station. None of the men have been publicly identified. The Cowlitz County Sheriff’s Office said the Sunday evening shooting happened in the area of Spencer Creek Road in Kalama. No officers were hurt. The shooting came amid a manhunt for the suspect or suspects responsible for the death of Cowlitz County Sheriff’s Deputy Justin DeRosier, who was shot after being sent to check on a disabled vehicle that was blocking a road about three miles east of Interstate 5 late Saturday, authorities said. DeRosier, a 29-year-old father and husband, died during surgery at PeaceHealth Southwest Medical Center in Vancouver. DeRosier and his wife had their first child in October. 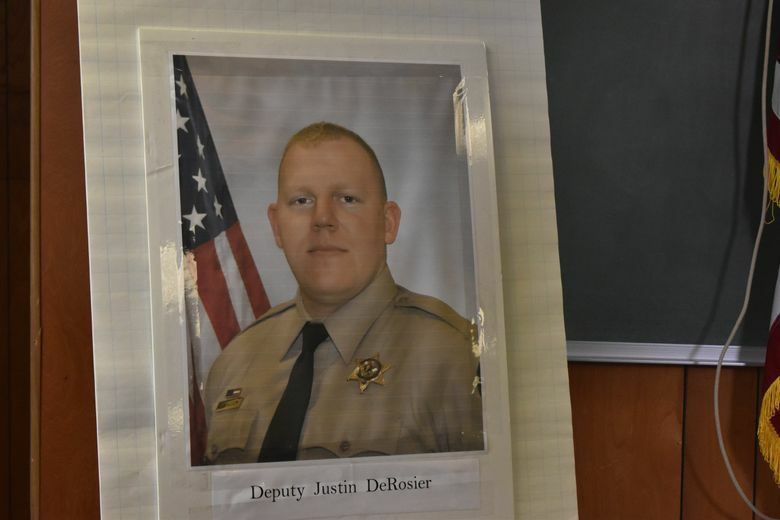 Darren Ullmann, Cowlitz County undersheriff, said few law-enforcement officers want to serve more than DeRosier did. Seattle Times staff reporter Dahlia Bazzaz contributed to this report.